NieR: Automata is the rare title that showcases what's absolutely so special about video games as a medium. From storytelling to gameplay, this is a truly unique experience that needs to be played. When Cavia’s action RPG NieR released in 2010, it didn’t make much of an impact. Despite having a heavily praised narrative, the gameplay simply didn’t hold up its end of the bargain. This led to an overall mixed reception, and as a result, many players (including myself) never experienced the journey of Nier and his daughter Yonah. Seven years later, though, the game has received the status of a “cult classic” and a sequel taking place thousands of years in the future called NieR: Automata was developed by talented Japanese developer PlatinumGames. 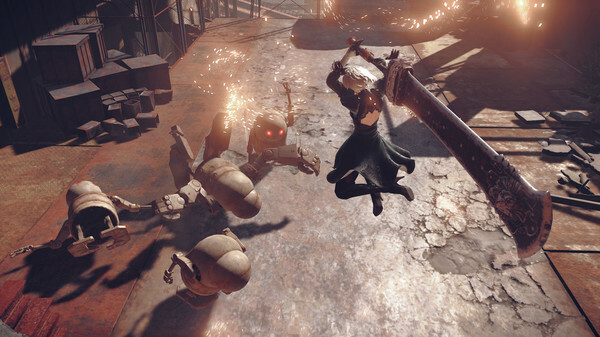 It’s here where vision meets design, as director Yoko Taro’s script is fully realized thanks to a stellar combat system that makes Automata as much fun to play as it is to watch the story unfold. 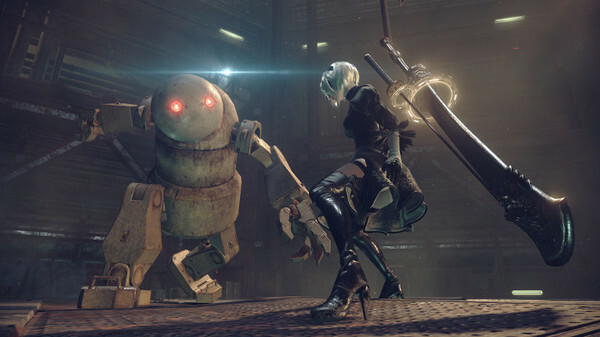 Players control various androids throughout the game, and start off in control of 2B — a combat unit that knows its way around a sword. She’s joined by a partner, a skilled hacker named 9S, on her mission to destroy the machines that have taken over Earth. Taking down these machines isn’t easy, though. These robotic foes come in a variety of shapes and sizes, and 2B will have to use her skillful dodge maneuver if she’s to accomplish the mission in one piece. The coolest part about the fast-paced combat is just how customizable it is, as the player can install various programs that alter 2B’s abilities and skills. After the first story arc, I had equipped the android with chips that allowed her to drain health from enemies she was damaging, and could switch between special attacks on the fly. Those that are having issues juggling the various robots they’ll be fighting (and it definitely gets challenging) can even equip auto-abilities that can allow the androids to basically fight on their own at a press of the left trigger, which is an awesome addition that even has a logical explanation in-game. While much of the action is reminiscent of other third-person character action games, NieR: Automata isn’t afraid to change genres at the slightest camera pan. At a moment’s notice, the camera may shift to a top-down perspective, and the game begins to play like a twin-stick shooter. Several seconds later, it’s suddenly a two-dimensional platformer. This may sound like it would lead to a disjointed experience, but the fundamental gameplay controls never change despite these shifts – helping the game keep its identity, no matter how often it may throw a seemingly random element at the player. Despite the combat being stellar, it’s also where the game’s few faults lie. NieR: Automata often throws a lot of enemies at the player, and since you’re exploring a pretty vast open-world (albeit one that has a few more walled areas than I would’ve liked), this can lead to some instances of the framerate dropping a considerable amount. This typically occurred while I was running away from a group of enemies, not fighting them, but it did occur occasionally within combat as well. Hopefully, the PC version (which comes out next week) will run better, but my PS4 Pro regularly suffered from slowdown and graphical pop-in when I was dashing through the environment. These issues though, and a few smaller ones like the frustrating to use in-game map, aren’t enough to detract from what’s otherwise a phenomenal experience. This goes beyond the satisfying swordplay, as the story is immediately captivating. Early on, 2B and 9S destroy their enemy — the machines — without a second thought. This begins to change as the mission goes on though, as machines begin to speak and display various acts of human behavior. The storytelling in NieR: Automata is second to none, and it brilliantly takes advantage of the medium that it’s in. While it’ll take over 20 hours to complete the game, players will likely end up seeing the credits wrap after around 10. However, you’ll want to replay it in order to see things from several different perspectives, from which the big picture really starts to become clear. Those that have played the original may be hip to some of the shocking reveals sooner than others, but the story is self-contained enough for myself, someone new to the series, to still be absolutely enamored with it (to the point where I’m going to track down a copy of the 2010 release immediately). The amount of emotions that NieR‘s story was able to get out of me is particularly impressive when you consider that the entire cast is comprised of androids and robots. It’s strange to type this, but all of the characters are truly humanized by the time the game’s fifth main ending is seen (there’s 22 in total — although the majority are gag endings that are easily missed). It’s hard to speak about a lot of what this title does really well without spoiling it, but Automata fully embraces that it’s a video game. There are certain gameplay moments (including the incredible end credits) that are absolutely mind-blowing, and this isn’t because of a story twist, but rather due to how the game manages to connect players into the overall experience. NieR: Automata isn’t without problems, but it’s also a truly groundbreaking game. It won’t push a single genre forward, but it has the potential to change the entire medium. It takes advantage of player interactivity in ways that I’ve never seen before in order to create an incredibly memorable experience that’s a joy from beginning to end. Anyone who’s interested in what gaming can do that books and movies cannot needs to experience Yoko Taro and PlatinumGames’ masterpiece. This review is based on the PS4 Pro version, which was provided to us by the publisher.